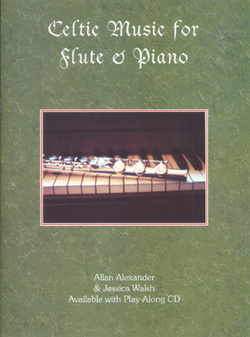 Celtic Music for Flute and Piano is a flute and piano version of the very successful book, “Celtic Music for Flute and Guitar.” The piano score has the piano left & right hand parts along with the flute melody, the flute score is a pull out section that can be played by the flute player away from the piano score. This music is an exchange of ideas between the musicians. In this book, sometimes the flute will have the lead and sometimes the piano. Play the beautiful “Hewlett” or the haunting “Separation of Soul and Body,” then turn to “The Song of the Chanter,” and you will be hooked. This is music that comes alive every time you play it.